The Argentine Crisis: Could It Hit Here? Could Argentina's dire economic situation ignite a new contagion that would sweep through Latin America, destabilizing the region, and further threaten America's ill economy? And, beyond that, could something like that ever happen at home, undermining America's middle-class stability? 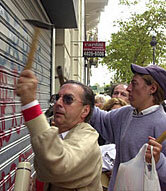 Argentines attack banks with hammers after government curbs withdrawals. Argentina's problems have seemed all-the-more troubling because the country was long considered a model of market reform. But beginning in January, when Argentina changed its monetary policy, its long-overvalued currency went into a free fall. Since then, inflation has soared. Confidence in the national currency has collapsed, resulting in massive bank runs. Today, by some estimates, at least 40 percent of Argentina's once predominately middle-class population lives below the nation's poverty line. Nearly one-quarter of the working population is unemployed. Argentina's experience demonstrates how high inflation impoverishes and embitters the middle class, devastates the poor, and undermines democratic institutions. That is a lesson for any country. But Argentina's economic woes ultimately have to do with its particular path of political and economic development and its distinctive culture of spending and corruption. When did Argentina embark on this "distinctive" path? After all, Argentina was once one of the richest countries in the world. The answer starts with Juan Perón. Now best remembered as the husband of Evita, Perón emerged as Argentina's strongman in the years after World War II. The embodiment of nationalistic populism, Perón built on the prewar legacy of fascist ideas, turning Argentina into a corporatist country, with powerful organized interest groups -- big business, labor unions, military, farmers -- that negotiated with the government for position and resources. A street protest against foreign banks in Buenos Aires. Perón nationalized large parts of the economy, put up trade barriers, and cut Argentina's links to the world economy -- long the source of its great wealth. Perón was also wildly popular -- until Evita's death in 1952. Thereafter, however, the economy became so chaotic that he prudently went into exile. An unemployed Argentine woman breaks down. The years that followed were characterized by a revolving door of elected presidents and military juntas. But the military showed little competence in running the economy. And after Argentina's defeat in the 1982 Falklands War, it lost its mandate to rule. The tasks facing democratically elected successor Raúl Alfonsín were huge. In the previous five decades, Argentina had gone through 24 presidents, 26 successful military coups and several hundred unsuccessful ones. Alfonsín's great contribution was the restoration of democracy and civic institutions, but his effort at reviving the economy failed. Hyperinflation had reached an almost-incomprehensible 20,000 percent, the economy was contracting, and food riots were taking place in the streets. Alfonsín was succeeded by a flamboyant, white-suited provincial governor, Carlos Menem. Menem ran as a Peronist with a platform of populism, handouts, and spending. But once elected, he launched one of the most radical, speedy, and all-encompassing market reform programs in Latin America. Next door, Chile, which had returned to democracy in 1988, was demonstrating that there was a workable alternative: renewed growth, links to the world economy, and low inflation. And within Argentina, a group of reformers led by Domingo Cavallo -- an economist who later became Menem's finance minister -- argued in favor of market reform. They believed that Argentina's long decline was the result of an irresponsible political culture. Politicians would spend and intervene no matter what the cost, sending inflation through the roof. Instead of railing against international trade, Cavallo argued, Argentina ought to be expanding it. Menem adopted Cavallo's ideas. Trade barriers were reduced. Competition and export orientation were encouraged. Under the new Convertibility Law, the peso was pegged to the dollar, and the money supply was restricted to the level of hard-currency reserves in the country (the so-called currency board). No longer could politicians feed inflation by spending their way out of trouble. Argentina also launched a privatization program, relieving the state treasury of hundreds of large, loss-making companies. Argentina's economy rebounded in the 1990s, and Argentines learned once again to trust their currency. But the period of renewed growth soon came to an end. A series of external shocks -- culminating in Brazil's devaluation of the real in 1999 -- pushed Argentina into a prolonged crisis. Particularly significant was the de facto devaluation of the new euro: Argentina's two main trading partners were Brazil and Europe, but since its own currency was tied to the dollar, Argentina's exports became more expensive and less competitive. By the time the government took the dramatic step of abolishing the Convertibility Law, it was too little too late. Confidence in the national currency collapsed, and a massive run on banks took off. The savings of the middle class were wiped out by inflation, the government's freezing of bank deposits, and its forced conversion of dollar contracts into pesos. Is Argentina a sign of what could happen here? It's highly unlikely. That country's current problems are not an example of market forces gone amok, but of market forces -- and further reform -- kept at bay for too long. What the crisis does show, however, is that a lasting market reform cannot rely on limited measures, however successful. The currency board system solved the problem of inflation and attracted foreign investment, but it overexposed Argentina to other problems. Tied to the dollar and severed from market indicators, the peso became unsustainably overvalued, just as the government's fiscal discipline broke down and the debt mounted -- hitting an unsustainable $142 billion. Ultimately, what brought the country to the brink of an implosion was runaway spending -- amplified by corruption and the breakdown in the rule of law. "It is mainly the economy of the public sector which generates the crises rather than the work of the markets and private companies," said Cavallo after his resignation. But will Argentines agree? Or will default, devaluation and the devastation of the middle class wash away the legacy that once made Argentina Latin America's leading reformer, and continue to undermine Argentines' confidence in their political and economic system? The answers will determine whether or not Argentina regains its footing and restores its prospects. Those are the real questions arising from Argentina's crisis, both for the nation as a whole, and for every Argentine family now struggling day-by-day, just to get by. Daniel Yergin is co-author, along with Joseph Stanislaw, of Commanding Heights: the Battle for the World Economy, which inspired the PBS series of the same name. Yergin, who won a Pulitzer for an earlier work, The Prize: The Epic Quest for Oil, Money and Power, is chairman of Cambridge Energy Research Associates (CERA), a leading analytic firm in the energy industries.